It’s with great sadness that we acknowledge the passing of Bill Taylor, and advocate for racers everywhere, and an all around nice man. Bill’s list of accomplishments in the racing community are legendary. He was a partner in the Coleman/Taylor Transmission shops with brother in-law Larry Coleman, and later founded Torque Converters Inc. (TCI). He would also establish Bill Taylor Enterprises (BTE Racing) when most men consider retirement. All three businesses thrive today. He also operated Lakeland International Raceway for 18 of it’s 19 years, and raced his own race cars throughout the 1960’s and 70’s. His ‘Kingfish’, ‘Super Cuda’, and ‘Super Duster’ funny cars were local legends that were also feared on a national level. Bill loved racing. It’s part of who he was. 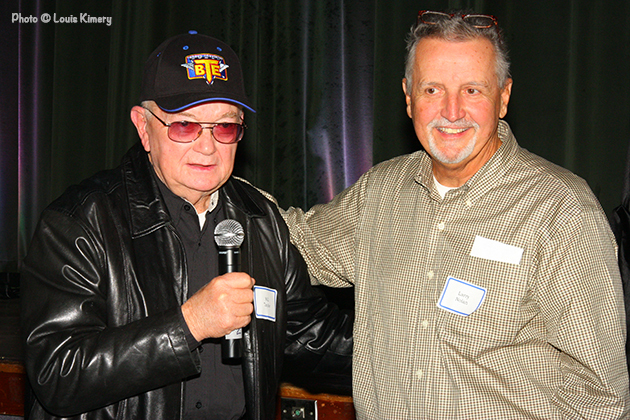 Larry Coleman and Bill Taylor were our 2008 Rodders Reunion honorees, as we focused on the Coleman/Taylor saga and the exploits of each as racing competitors. It was a big night, and we barely scratched the surface of their respective careers. In the photo above, is Bill addressing the crowd with Larry Nolan at the 2008 Reunion. When Bill was a race track operator, he earned a reputation among the drag racing community as a fair and honest man. He was well respected by his peers. He will be missed. A Memorial Service in his honor will be held Wednesday, April 15, 2015 from 10:00 am - 11:00 am, at the Collierville Funeral Home, 534 West Poplar ave. Collierville, TN 38017.